It seems like everywhere I turn in California a new winery or project is popping up. Sure, visiting California’s reference point wineries is always exciting, but the real thrill of discovery lies in uncovering the new. In this article, readers will find a number of new wineries most of them run by young, emerging winemakers. Tegan Passalacqua is Larry Turley’s vineyard manager and winemaker. 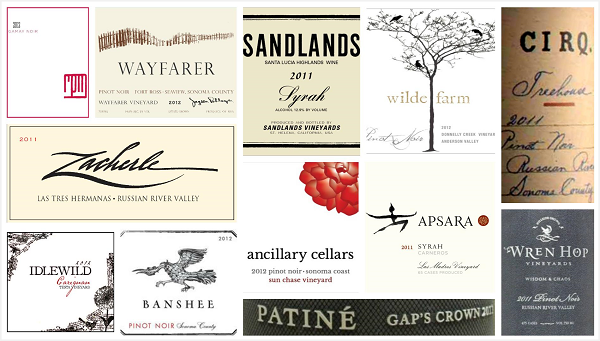 Passalacqua’s Sandlands wines are among the most exciting new and upcoming releases I tasted. Mike Smith worked under Thomas Rivers Brown and now makes Mark Carter’s Napa Valley wines. Smith’s Patiné and Ancillary Cellars Pinot labels are well worth discovering, as is Apsara, a small project run by Smith’s assistant, Robin Akhurst. Michael Browne’s new project, Cirq, is full of promise. The same is true of RPM, which brings together the talents of Rajat Parr, Duncan Meyers and Nathan Roberts in search of excellence in Gamay. Some of these wineries have made just one or two vintages. Others are just about to make their first commercial release, such as Sandlands and Jayson Pahlmeyer’s Wayfarer, one of the most exciting debuts in the new Fort Ross-Seaview AVA. And so it goes. That is just a smattering of what is in this article. I hope to bring Vinous readers more of what’s new in California in the future.